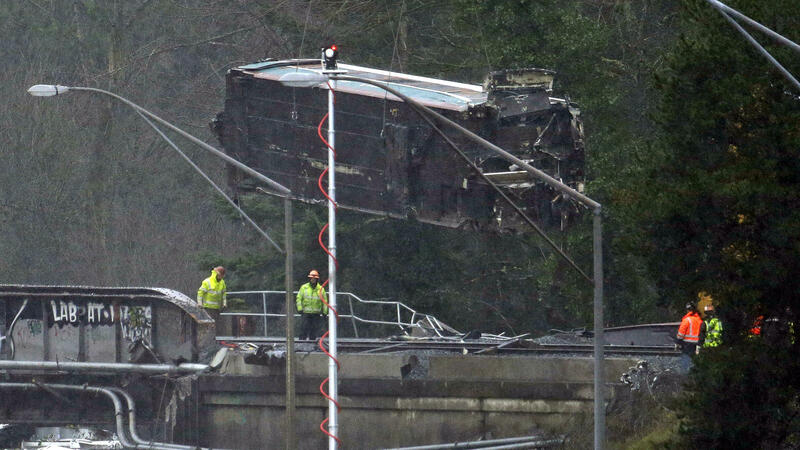 A damaged Amtrak train car is lowered from an overpass Tuesday at the scene of a train crash onto Interstate 5 a day earlier in DuPont, Wash. Federal investigators say they don't yet know why the Amtrak train was traveling 50 mph over the speed limit when it derailed. The rail cars will be taken to a nearby military base for closer analysis. 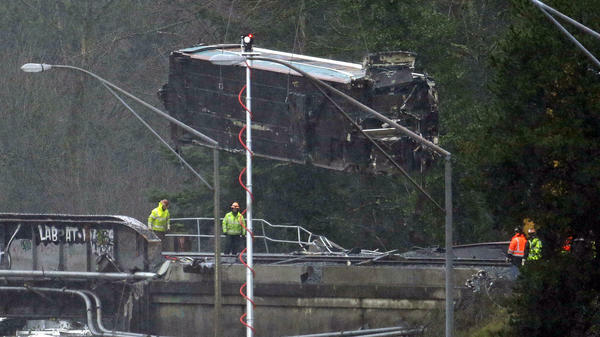 Answering those questions may help investigators determine the most important question of all: Why the Amtrak train was speeding along at 80 mph where it derailed — a curve and overpass over Interstate 5 near DuPont, Wash., with a speed limit of just 30 mph. Three people were killed in the derailment, and dozens more were injured. Crews are removing the tangled mess of Amtrak cars, some of which were left dangling over I-5 from the overpass bridge. Cranes are lifting the rail cars onto flatbed trailers, which are then moving them to a secure location on a nearby military base, where National Transportation Safety Board investigators can inspect the rail cars more closely. Regardless of the final determination of the cause of the Cascades derailment, some critics say it could be another sign of what the NTSB has called a "lax safety culture" at Amtrak. Just last month, in announcing the probable cause of an Amtrak crash in 2016 that killed two track workers, NTSB chairman Robert Sumwalt blasted the railroad, "Amtrak's safety culture is failing, and is primed to fail again." "Glass, people were all coming towards me, flying in the air"
Scott Claggett had started Monday a little pumped up to try a new way of getting to a business meeting in Portland. Amtrak Cascades train number 501 was taking a new, faster, more direct route for the first time, and Claggett says he enjoyed moving from car to car on the fast-moving train before settling into a seat to get some work done. "Next thing I know it, the train is kind of leaning to the left," Claggett says. "I felt like that wasn't a good feeling, and the second that I discovered it wasn't a good feeling is when my car completely twisted — and glass, people were all coming towards me, flying in the air." Another passenger, Patricia Freeman, says she felt the train jolt, "and I thought, 'Oh, that's not good — there's no turbulence on trains.' " Freeman says she tried to grab onto anything she could find, then felt a "horrible impact." "I kinda got flung across the aisle and onto the floor," she says. "I was just going back and forth across that train car like a pinball in a pinball machine." Experts say such descriptions are evidence of a train going off the rails at a high rate of speed. "Just the energy that's involved causes significant damage and greater opportunity for injury," says Bob Chipkevich, who was director of railroad investigations for the NTSB until he retired in 2010. He says the question for investigators now is why the train was going 50 mph over the speed limit when going into the curve before crossing over Interstate 5. "They'll be questioning the train crew about their knowledge of the particular route, (about) their training and their qualifications," Chipkevich says. "And they'll also be looking at the information that was available to the crew (about the route) as they were traveling." NTSB investigators say the engineer did appear to be familiar with the new route after several trial runs in recent weeks. "Under Amtrak policy, he couldn't operate the train unless he was qualified and familiar with this territory," says NTSB lead investigator Ted Turpin. Chipkevich says investigators also want to know exactly what the crew was doing when the train went off the rails. "In railroad accidents over the years, operator distraction or loss of situational awareness have been causes identified in train derailments," he says. Situational awareness is a key term here. National Transportation Safety Board member Bella Dinh-Zarr says there was a second person in the cab of the locomotive with the train's engineer. "The two people who were in the cab, as far as we know, are the engineer and a conductor who was familiarizing himself with the territory," Dinh-Zarr said at a news briefing on the crash Tuesday evening. Dinh-Zarr says that may not be improper; it's part of a conductors job to become familiar with a new route. But she says investigators are looking into whether the presence of the conductor may have distracted the engineer. "Distraction is one of our most-wanted list of priorities at the NTSB," adding that looking into possible distractions, including an examination of the cell phones of all crew members, is standard protocol in NTSB investigations. The NTSB determined that in a May 2015 derailment in Philadelphia, an Amtrak engineer lost situational awareness "after his attention was diverted to an emergency involving another train." The crash of train 188 killed eight people and hurt scores of others. One piece of evidence from Monday's Washington state derailment that might be telling comes from the train's event data recorder. "It looks like, in our preliminary analysis, that the emergency brake was automatically activated when the accident was occurring, rather than being initiated by the engineer," Dinh Zarr says. There are also questions about whether a safety system called positive train control could have prevented this derailment. Positive train control will override the engineer and automatically slow down or stop a train if it's going too fast, but Amtrak officials acknowledge that even though the technology was installed in the locomotive and along this portion of the route, it was still undergoing testing and wasn't yet operational. "It's yet another reminder that that technology will save lives, and it's important for railroads to implement it as soon as possible," says Sarah Feinberg, former administrator of the Federal Railroad Administration under President Obama. "This is something that we've been talking about for decades — and when I say we've been talking about it for decades, that is not an exaggeration. We started talking about positive train control in the 1960s." In 2008, Congress required all U.S. railroads to install and implement positive train control by 2015, but then gave the railroads more time. Some are required to have it up and running by the end of next year, but most have until 2020. Amtrak now has positive train control activated on only about a quarter of its nationwide passenger rail system, mostly in the Northeast corridor. Safety experts say a handful of other fatal train wrecks in recent years possibly could have been prevented by the technology. Investigators are working to determine why an Amtrak train was going so fast when it derailed yesterday south of Seattle. They say it was traveling 80 miles an hour as it entered a curve and crossed an interstate highway overpass where the speed limit is just 30 miles per hour. Three people were killed. Dozens more were injured. NPR's David Schaper has the latest. DAVID SCHAPER, BYLINE: For Scott Claggett, it was just another business meeting he was heading to in Portland. But he was a little pumped up to try a new way of getting there. SCOTT CLAGGETT: This was the first time taking the Amtrak. I was pretty excited. I discovered in the morning that this was a new route, a new time. SCHAPER: Amtrak Cascades train number 501 was taking a new, faster and more direct route for the first time. And Claggett enjoyed moving around the 80-mile-an-hour train for a while before settling into his seat. CLAGGETT: Next thing I know it, the train is kind of leaning to the left. I felt like that wasn't a good feeling. And the second that I discovered it wasn't a good feeling is when my car completely twisted and glass, people were all coming towards me, flying in the air. SCHAPER: Another passenger described bouncing around her car like a pinball. The question for investigators now is why the train was going 50 miles an hour over the speed limit when curving and crossing over Interstate 5. The National Transportation Safety Board's lead investigator, Ted Turpin, says even though it was a new route, the train's engineer had done several trial runs over it in recent weeks. TED TURPIN: Basically under Amtrak policy, he couldn't operate the train unless he was qualified and familiar with this territory. SCHAPER: But the NTSB's Bella Dinh-Zarr says the engineer was not alone in the cab of the locomotive. BELLA DINH-ZARR: The two people who were in the cab, as far as we know, are the engineer and a conductor who was familiarizing himself with the territory. SCHAPER: Dinh-Zarr says this may not be improper. It's part of a conductor's job to become familiar with a new route. But she says investigators are looking into whether the presence of the conductor may have distracted the engineer. DINH-ZARR: Absolutely. Distraction is one of our most-wanted list of priorities at the NTSB. SCHAPER: One piece of evidence that might be telling - Dinh-Zarr says the train's emergency brake was automatically activated when the train started going off the rails and was not activated by the engineer before. The derailment could be another sign of what the NTSB has called a lax safety culture at Amtrak. Just last month, in determining the probable cause of a fatal Amtrak crash in 2016, NTSB chairman Robert Sumwalt blasted the railroad, saying, quote, "Amtrak safety culture is failing and is primed to fail again." There are also questions about whether a safety system called Positive Train Control could have prevented this derailment. Positive Train Control will override an engineer and automatically slow down or stop a train if it's going too fast. But Amtrak officials acknowledge that even though the technology was installed in the locomotive and along this portion of the route, it was still undergoing testing and wasn't yet operational. SARAH FEINBERG: It's yet another reminder that that technology will save lives. And it's important for railroads to implement it as soon as possible. SCHAPER: That's Sarah Feinberg, who ran the Federal Railroad Administration under President Obama. FEINBERG: I mean, this is something that we've been talking about for decades. We started talking about Positive Train Control in the 1960s. SCHAPER: In 2008, Congress required all U.S. railroads to install and implement Positive Train Control by 2015 but then gave the railroads more time, and most have until 2020. Amtrak now has Positive Train Control activated on only about a quarter of its nationwide passenger rail system, mostly in the northeast corridor - that despite a handful of other fatal train wrecks in recent years that many safety experts say possibly could have been prevented by the technology. David Schaper, NPR News. Transcript provided by NPR, Copyright NPR.